Occasional Brief Observations: La nouvelle "union"
This week 43 heads of state and government convened in the French capital for the inaugural meeting of a new organization, the UPM (Union Pour la Mediterranée), or Mediterranean Union. Grand pomp and circumstance... The brainchild of French President Nicolas Sarkozy, its grandiose aim is to "... transform the Mediterranean into an area of peace, democracy, cooperation and prosperity..."
This blogger wishes this group success. However, he does note that Sarkozy and the French seem to assume that they will maintain a leadership position in this organization, exactly on what basis this blogger isn't sure... It seems like they are taking a lot for granted! 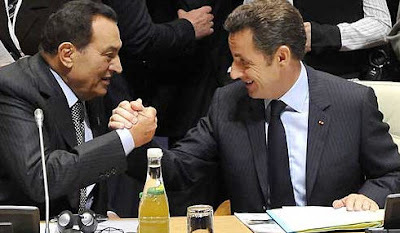 The photo below sums up the present and (a possible) future - today the heads of Egypt and France shake hands in agreement (in a weird way); in the future they will likely be fighting each other for control of the direction of the UPM.